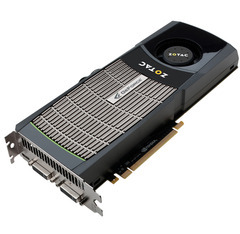 Zotac have released a new graphics card based on next-generation NVIDIA fermi architecture. The new ZOTAC GeForce GTX 480 and GeForce GTX 470 graphics cards promise to be the world’s most powerful graphics cards capable of delivering a phenomenal gaming experience and unmatched processing power. Features include new Microsoft DirectX 11, 32x anti-aliasing, NVIDIA 3D Vision Surround and HDMI 1.3a technologies. The next generation CUDA architecture, code named “Fermi”, is the most advanced GPU computing architecture ever built. With over three billion transistors and featuring up to 512 CUDA cores, Fermi delivers supercomputing features and performance at 1/10th the cost and 1/20th the power of traditional CPU-only servers. It’s a name to watch out for if you’re buying a new graphics card.